The Great Vine in the Hampton Court Palace Gardens is the oldest and largest known vine in the world. It was planted around 1768, having come from a small cutting at Valentine's Park in Essex. The Vine usually blossoms in early May with small and fragrant flowers and the grapes are harvested in September. 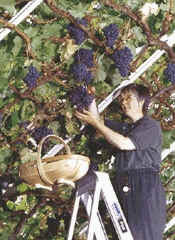 It takes the Vine Keeper around three weeks to remove all the grapes. The crop averages 500 to 700 bunches of grapes. Today, the full crop of black eating grapes is sold in the palace shops, and part of the proceeds each year are given away to charity. We know from the Gospel we heard this morning that as Jesus and his apostles walked together on Maundy Thursday from the Upper Room to the Garden of Gethsemane, He continued the teaching which he had started at the Last Supper with those words ‘I am the true vine’. Legend has it that, as they walked along He noticed a large vine growing up a wall on the roadside, he pointed to it and then, as He had done so often, used it as something physical and touchable to explain to them something spiritual and intangible, about His relationship with them (and us). That relationship is what we call ‘The Church’ and we who are here this morning are an example or manifestation of it. So let us see what the Parable of the Vine has to teach us about Jesus Christ and ourselves. And let’s begin with the vine Hampton Court because it’s something we can go and see for ourselves. Here are a few facts about it which will help us understand what it has to teach. The Hampton Court vine didn’t just ‘happen’. It was deliberately planted by someone with a particular purpose in mind, namely that it should produce, and go on producing, high-quality grapes. The vine exists and carries on producing grapes today because it has been looked after and cared for by generations of gardeners and viticulturists (that’s people who look after vines as a profession). In other words, the vine didn’t just take care of itself. It takes a long time, over four months, from the first sign of anything happening (the blossom) to the final product, the grapes, reaching perfection. The blossom and the grapes look, and are, so different from each other that you might be excused for doubting whether they are related in any way. The final product, the grapes, is not the property of the gardeners who have worked to produce it, and, thanks to the generosity of its owner, the Queen, their sale is used not for her benefit but for those people who depend on the charities to which she gives it. Now let us think of how this applies to the Body of Christ, His Church upon earth, and not least to that instance of it which is known as ‘All Saints, Sydenham’. The Church of Jesus Christ didn’t just happen’. ‘[It] is His new creation by water and the Word’ as the well-known hymn says. We believe that, like the rest of creation, the Church was designed to grow, blossom and bear fruit in a particular way, with a particular purpose in mind, namely that men and women and children of every race, language and culture should, by becoming part of it, be reconciled to our Heavenly Father through the sacrifice of His Son Jesus Christ. Like the vine, the Church of Jesus Christ still exists today because it has been looked after and cared for by generations of Christians, lay and ordained who have ensured that is kept properly watered, fed (on Word and Sacraments) and protected from pests and fungi (such as false beliefs) which could damage it irreparably. In other words, the Church doesn’t just take care of itself. The Church also often takes a long time to produce results. Once in a blue moon, so to speak, something or someone, a person or an event, arises who does make an immediate and dramatic difference. Think of Saint Paul on his missionary journeys, the persecution under Diocletian, and more recently the Wesley Brothers, John and Charles, of the Evangelical and Oxford Movements. All of these had an enormous effect on bringing people to Christ, even though, in the case of Diocletian it was precisely the opposite effect to the one he intended. But such ‘instant results’ are the exception. The growth of the Church is more like that of the vine: between blossoms, which look good, and grapes, which taste good, there is a long time when it seems that nothing very interesting his taking place. But that something has been going on all the time, the harvest will prove. The end-product so to speak, is not only the wellbeing of those people like you and me whom God has ordained to use in His Plan for the Salvation of His World. Our welfare, yours and mine, though indeed of infinite importance to God, is more like a by-product than the end-product of God’s viticultural skills. His Church exists primarily for the benefit of those who are outside it. So those are four things we can learn from Jesus’s words about that vine which he passed on the way to the Garden of Gethsemane. But there is a fifth and extremely important lesson. In one respect there is, literally, a world of difference between anything we can learn from thinking about the Hampton Court vine and what he had to tell his disciples and us about the nature or our relationship to Him. The difference lies in what Jesus actually said. His words on that occasion were ‘I am the vine, you are the branches’ not ‘I am the root’ or ‘I am the stem’. In other words, Jesus is not just someone we Christians are attached to (like a bunch of grapes is attached to a vine) or even someone whose teaching and example we try to follow; our relationship with Him consists in our becoming part of Himself. It’s not a relationship of attachment, but incorporation: As he told His apostles at the time, ‘[You must] remain IN Me, with Me IN [you]… for cut off from Me you can do nothing’’. As someone once said in a sermon which I have never forgotten, "that little word ‘IN’ is the most important word in the Bible". Through our Baptism we are incorporated or ‘bodied into’ Christ: which means that, unlike a bunch of grapes, where you can easily separate one grape from another, or the stem from which they have grown, we are all part of a single unity, the Body of Christ upon earth, and whatever we do, or fail to do, is bound to have a repercussion for good or ill on everyone else who is in that Body and vice versa. Of course participating in Christ’s divine nature necessarily involves us in the duty of trusting and obeying Him at all times – but being a Christian means so much more than that. It means nothing less than letting Him transform us, by Faith and Sacrament, from mere human beings into becoming the Sons of God (something which can only be achieved by Divine Grace): changing our human nature into one resembling His Divine Nature, as the Son of God, ‘eternally begotten of His Father before all worlds’. That is something which anybody who remains outside the Church can never understand. It has to be experienced to be understood, let alone believed. But – and this is something far more serious –very few people inside the Church understand this either. So let me remind you exactly what Jesus said to us earlier this morning about our relationship, because it’s only in the light of this that we can understand how He can use us for the purpose for which we were individually designed by Him and His Heavenly Father.